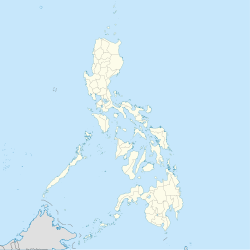 Cabagan, (Ibanag: Ili nat Cabagan; Ilokano: Ili ti Cabagan; Tagalog: Bayan ng Cabagan), officially the Municipality of Cabagan, is a 1st class municipality in the province of Isabela, Philippines. According to the 2015 census, it has a population of 50,174 people. Cabagan had been the business center of three nearby towns (Santa Maria, San Pablo and Santo Tomas) before they had their own market. It is locally known for its pancit Cabagan. Its people are called Ybanags. Nowadays, Ybanags are well educated and the source of the province's top politicians, professionals and a world class athlete. During Christmas, the Cabagan Square Park could be seen flashing brightly with many Christmas lights and lanterns. Cabagan's top schools are Cabagan Science Elementary School; Saint Ferdinand College - Cabagan Campus; Isabela State University; and Delfin Albano High School (Main Campus). The Malasi Lake is a sanctuary for migratory birds located in barangay San Antonio and has been hailed by the DENR. The biggest gymnasium in Isabela and in the whole Region 2 is located in this town and the century-old well that was built by the Spaniards, located at St. Ferdinand College, Cabagan Campus.The carousel in Cabagan Square Park has been dubbed by the townspeople as the largest in the Philippines. Etymologically, the name Cabagan may have originated from the native word bag or bajaque, not because "G-strings" were used here or made in Cabagan, but most probably because there were stores in the village, Cabagan could have also been derived from the word cabbagang, meaning "pilgrim" or stranger. Based on the fact that Cabagan at the time, was in constant contact with members of the "pagan tribes" from Diffun, namely southern Isabela as well as with the "Kalingas", of the neighboring Cordillera mountains. The Cabagan of old, that existed from 1646 to 1877 was simply called, "Cabagan". In 1877, the Spaniards decided to transfer present-day Cabagan to a new site, abandoning the old Cabagan. In 1888, the Spaniards resurrected the abandoned Cabagan, into a new town. With this development, there were now two Cabagans. The Spaniards rectified the predicament by naming the first Cabagan as Cabagan Viejo, and the second Cabagan as Cabagan Nuevo or the new Cabagan. Apparently, the name was not to the liking of the new rulers, the Americans. When the Americans came to rule the Philippines after the Spaniards, they renamed Cabagan Nuevo as simply "Cabagan", and the old namesake, as the town of San Pablo. The old Cabagan, Cabagan Viejo which is now called "San Pablo", was the key town in the colonization of the Irrayas and to some extent Diffun, i.e., southern Isabela. The Irraya rebelled and the only ones that the Spaniards could claim, were some three hundred families who agreed to establish the village of Maquilla, near Tuguegarao City. Cabagan became a charter town in November 30, 1646 and ecclesiastically in May 15, 1647 with Saint Paul the Apostle as the patron saint. The new Cabagan came to exist, because the Spanish government decreed that in January 25, 1877, the old Cabagan or San Pablo of today, be transferred from its old site, to the one that is now occupying. The brainchild of the transfer of Cabagan, was parish priest Pedro Ricart, who then made representations with the Spanish government, for the transfer. Father Jose Burgues History of Cagayan Valley gave the unhealthiness of the old site, the reason for the transfer. Others had stated though, that Cabagan was transferred because progress appeared to be bypassing the old Cabagan, in favor of the villages to the south, near Cabagan's present site. The new site was the area between the villages of Ugad and Luquilu, villages that exists up to this day. The site is not far from the old, with the church of the new Cabagan just some three kilometers or so, south from that of the old. The transfer was not without friction though. A number of Cabagan's inhabitants opposed the transfer. But the missionary's will had prevailed. In contempt, as it were of the natives' opposition, the missionary uprooted the Church of the old Cabagan and brought the images and other vestments, to the new Cabagan. When the Spaniards established a new town, they also endeavored to build a massive church and convent made of stone, brick and mortar. From 1877, when the new Cabagan was established, and culminating with the Philippine Revolution that deposed the ruling Spaniards 19 years later (1896), the then governing Spaniards were still not able to complete all constructions needed, for the new Cabagan. Cabagan is a known meeting place among revolutionaries during the Spanish occupation. In the 2015 census, the population of Cabagan, Isabela, was 50,174 people, with a density of 120 inhabitants per square kilometre or 310 inhabitants per square mile. Cabagan, as part of the Irraya region and its language, was Irraya. The Spaniards however, made the Ibanag "The Official Language of the Valley", and had exerted all efforts that everyone speak the dialect. Since then, the Irraya tongue gradually disappeared from the Cabagan psyche. When some people utter Irraya before, they were discouraged or forbidden to speak, because that was the language of the "pagans" at that time, the Kalingas. Whenever the townsfolk enter the poblacion, none would speak of Irraya, for they would be considered despicably as, a "Kalinga" or as "ignorant persons", living in the mountains. Today, no one speaks Irraya. There are however, a few barrios in Cabagan today, like San Bernardo and Tallag, wherein the Ibanag dialect gets interspersed with Irraya. However, some older generation townsfolk, could also remember sentences in Irraya. Ilocano is also spoken in parts of Cabagan because of migration of poor Ilocanos from other parts of Luzon to seek opportunities. Cabagan is famous for its eponymously named 'Pancit Cabagan' a local dish which was introduced by a Chinese trader in 1887 and has gained popularity in different parts of Luzon. There are several popular restaurants (locally called 'Panciterias') serving this dish along the main road/highway in Barangay Centro, Anao, Ugad and Cubag which include Felicitas Panciteria, Aling Kikay, Loling's Panciteria, Eddie's Restaurant, Josie's Panciteria, KJM, KCJM, Mariloi's Panciteria, Pin-tag Bistro Cafe and Zein's Panciteria. Alex Pagulayan, the 2004 world champion in billiards, hails from San Juan, a remote barangay of Cabagan. ^ "Province of Isabela Official Website: Cabagan". Retrieved 23 February 2017. ^ "Cabagan, Isabela: Average Temperatures and Rainfall". World Weather Online. Retrieved 31 October 2015. ^ "Pancit Cabagan: Recipe and Origin". Retrieved 23 February 2017. ^ "Birdwatch.pH: Malassi Lakes Trip Report". Retrieved 23 February 2017. ^ "Amazing Malasi Lakes". Retrieved 23 February 2017. ^ "Historical Landmarks, Places of Interest, and Things To Do in the Philippines". Retrieved 23 February 2017. ^ "Tulap Falls - On Going Road Construction". Retrieved 23 February 2017. ^ "St. Paul Parish Church of Cabagan". Retrieved 23 February 2017. ^ "Cansan Cabagan, Round Rock Resort". Retrieved 23 February 2017. ^ "Xentro Mall Cabagan". Retrieved 23 February 2017. ^ "Cabagan town celebrate 'Pansit Festival'". Retrieved 23 February 2017. ^ Bicarme, Thelma. "'KKK' festival highlights Cabagan, Isabela Patronal fiesta". Retrieved February 23, 2014. ^ Mercado, Angely (January 22, 2014). "Cabagan town to stage 'Zambali'". Philippine Information Agency (PIA). Retrieved 23 January 2014.